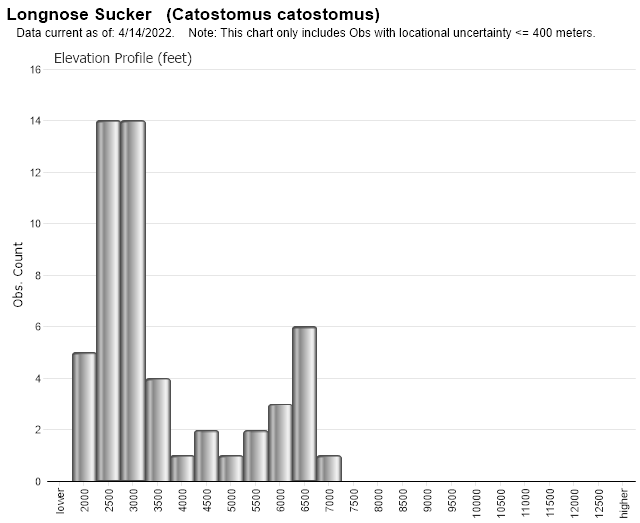 The sucker with the greatest statewide distribution is the longnose sucker. It is found in all three of our major drainages and from mountainous streams to plains reservoir habitats. 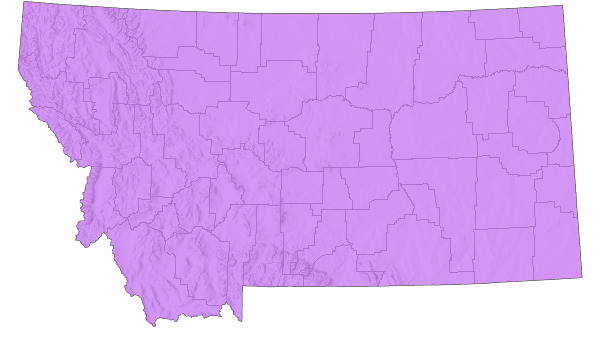 In Montana, the largest weigh about 5 pounds. Longnose suckers are most abundant in clear, cold streams. In the springtime, spawning migrations into small tributaries are common and males develop bright red colors on their bodies. Longnose suckers are one of the most frequently caught fish by Montana anglers. Back, upper sides, and head to below the eye dark olive to slate; underparts white or yellow. Breeding males are nearly jet black on upper half of head and body and may have red midside band. Has 9 to 12 rays in dorsal fin and more than 15 scales above lateral line. Spawning fish usually move upstream or from lakes into tributary stream. Fish also move into tributary streams. Cold, clear streams and lakes; sometimes moderately warm waters and turbid waters. Spawns over loose gravel beds in riffle areas. Diet includes considerable algae, midge larvae, and most aquatic invertebrates. Formation of Lake Koocanusa by Libby dam has been very favorable to longnose sucker populations. Longnose suckers x white sucker hybrids reported in Montana. Sexually mature males in 4 years, females in 5 years. Spawns April - early July at 54-59 degrees F. Incubation: 10-20 days. Middle Missouri River populations spawn mid April - mid June with peak in May. Tripp, D.B., and P.J. McCart. 1974. Life histories of grayling ( Tnymallus arcticus ) and longnose suckers ( Catostomus catostomus ) in the Donnelly River System, Northwest Territories. Pages 1-91 iji Arctic Gas Biological Report Series, Volume 20, Aquatic Environments Limited, Calgary, Alberta. Web Search Engines for Articles on "Longnose Sucker"